The Nikon Monarch 5 feature a lightweight, rugged body and exceptionally clear lenses. These binoculars are perfect for the active outdoor adventurer or birding enthusiast. The Rubber-Armored coated body provides shockproof protection. Completely waterproof and fog proof lenses are treated to resist scratches, allowing years of crystal-clear viewing. Advanced dielectric prism coating offers a crisp and bright image enhancement for superior performance in low-light conditions. The Extra-low dispersion glass enhances contrast and resolution. The Streamlined focus wheel effortlessly glides for easy image adjustment. Eyecups have multiple settings for correct eye positioning, providing generous and comfortable eye relief. Flip-down lens covers are included. These binoculars come with an included carrying case, smart-phone adapter, bino-harness, and a cleaning kit. All part of the excellent package and great value for your dollar. Field of view 288 ft. at 1,000 yds. Dimensions 5.7″L x 5″W x 2.1″D. Price: $319.99, for the 10×42 model. This price includes a case, a bino-harness, a smart-phone adapter, and a cleaning kit. Amazon Prime is an option that you should definitely consider to get free shipping on many millions of items sold on Amazon. Here are some of the many excellent features of this binocular. This is, in my opinion, an excellent binocular. These binoculars out-perform similar binoculars in this price range. There is very little bad to say about these binoculars. At just over $300.00 USD, the Nikon Brand, and all the included accessories, you simply cannot go wrong with this purchase. Binoculars were one of my first pieces of technical gear that I owned as a youngster and for this reason, I am a big fan of binoculars. They are easy to carry in the bino-harness and easy to operate. Do not hang them down your neck. Get a Bino-Harness. In this case, the bino-harness is included. This product comes with a bino-harness and there are many models of bino-harnesses available on the market. In addition to simple harnesses, there are also harness and case combinations that you may like as well. All outdoor enthusiasts and Nature lovers can benefit greatly with the use of binoculars. Binoculars extend your visual reach of Natural beauty and this is a great advantage in any wilderness setting. Binoculars can also be used at sporting events, music concerts and for other activities where extended visual reach is an advantage. These Monarch 5 Nikon Binoculars are very popular for Birding and observing other life and natural forms in the outdoors. 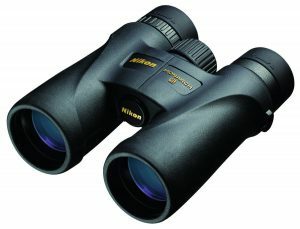 The Monarch 5 by Nikon are the latest pair of binoculars that I have purchased for my wilderness adventures. They are light-weight, have an armored body and very clear lenses. The waterproof and fog proof lenses are treated to resist scratching. A lens pen and a bino-harness will make a great addition to these binoculars. Once you wear a bino-harness, you will never want to be without one again. These binoculars give very sharp images in low-light conditions. If you have any comments, questions, or suggestions about these binoculars, I would be very happy to answer them. I use these binoculars very frequently and I am very pleased with them. Contact Me, if you need further assistance in this area. What a great article! Thanks for posting that. What a great read, thanks for the info! These are some fierce ‘nocs with the harness around the neck dude! You could see a lot of things you wouldn’t otherwise be able to see if it were not for having it! That’s just my two cents. Thanks again for the great article! I’ll be sure to keep an eye out for your future content! Thanks, Nik, for stopping to read my post. I’m happy that you found my article nice to read. These are great binoculars and a pleasure to carry and use.